How to Do the Magic Knot Trick. Magic knots are one of the oldest magic tricks. Knots by their very nature are mysterious. Knot tying is a time-tested way to involve the audience. This trick involves an irresistible bet that defies the odds and leaves the audience both puzzled and ready to try the trick on their friends. Begin by taking a piece of rope, ribbon or cord and showing it to the audience and allowing them examine the rope. Bet someone in the audience that you can tie a knot in the middle of the rope without letting go of the rope. This is a seemingly impossible task and most often results in audiences putting up a $10 bet. Have the audience member lay the rope on the table. Tell the audience member to grab the rope anywhere along its length and remind them they cannot use their fingers or release the rope once they have grabbed it. Explain that it is impossible unless you know the secret and allow them to struggle to tie a knot. If there is time, let the person take the rope with them and try as long as they like. Remind the person when they return that it doesn't matter how you grab the rope and you will win the $10 if you can tie a knot in the middle of the rope without releasing it. Fold your arms. Do not cross your arms when grabbing the knot. Place one hand on top and one hand on bottom. Lean down and grab one end of the rope with the underneath hand. Grab the other end of the rope with the top hand. Pull the arms apart, and the knot will tie itself right in the middle of the rope. 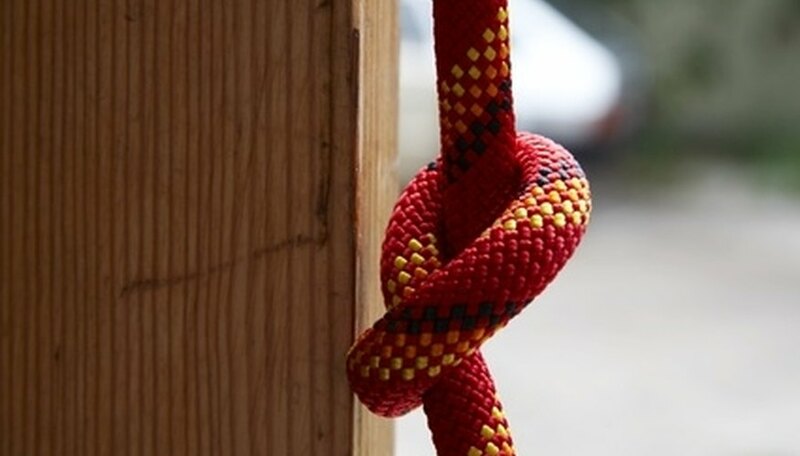 How do I Loosen a Knot in Rope?